Devenir tracks health savings accounts in the credit union industry closely through NCUA filings and variety of other sources. Below are some key points from our Q1-2018 analysis. $1.59 billion – Total HSA assets held at credit unions totaled $1.59 billion as of 3/31/18, up 8.1% year-to-date. 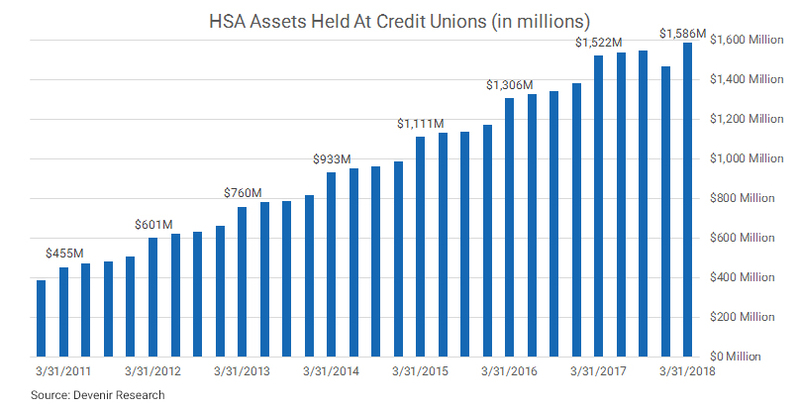 844 – There were 844 credit unions holding HSA assets as of 3/31/18 (15% of credit unions), up from 819 credit unions three years ago. There were 35 credit unions that each held at least $10 million in HSA assets as of 3/31/18. 47% – The 25 largest HSA asset holders among credit unions hold 47% of all HSA assets at credit unions. $2,570 – Devenir estimates the average HSA balance at a credit union is $2,570 as of 3/31/18, up 2.7% year-over-year.